Choose Your Carbon Revenue Priorities. Available in alternate formats, upon request. The federal government has said all provinces must introduce a system to price carbon emissions as part of Canada's national climate change strategy. 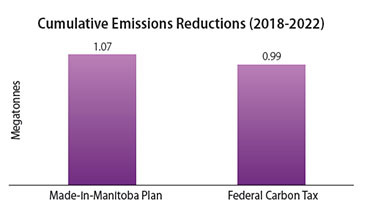 The federal government has suggested its own five-year plan for the provinces to adopt, however the Manitoba government believes a Made-in-Manitoba climate and green plan is the best choice for Manitoba families and businesses. The federal government says it will impose its high carbon price plan on Manitobans if we do not have our own plan by next year. That plan will see the carbon price rise to $50 per tonne not $25 per tonne. It lets Ottawa decide where to spend new carbon price revenue in Manitoba. It costs less than the federal government's carbon tax. It reduces more carbon pollution than the federal government's carbon tax. It saves families and businesses money. It lets Manitobans decide where to spend new carbon pricing revenue, not Ottawa. We believe a Made-in-Manitoba plan with a lower carbon price is justified because historically, Manitoba has invested billions of dollars in clean, renewable hydroelectricity. Our Made-in-Manitoba plan credits these early investments in Manitoba Hydro that have kept our greenhouse gas emissions low. Our Made-in-Manitoba plan protects our environment while growing the economy. It provides more carbon emission reductions at less cost to you and your family. Please provide your choices about our Made-in-Manitoba Climate and Green Plan. 1. Do you want: a low and level carbon price (The Made-in-Manitoba Plan), or a rising carbon tax (The Federal Government Plan)? A carbon price generates new money for government to spend on climate and green priorities. The Made-in-Manitoba carbon levy will raise about $260 million each year. How would you like to see this money spent? Helping Households -This category could see carbon revenue used to lower taxes or provide a direct rebate to families and households to help offset increased fuel and heating costs. This could also be used to help offset the impacts of any hydroelectricity rate increases. Investing in Green Projects and Clean Growth -This category could see some of the carbon revenue invested into green projects and clean technologies that would reduce emissions, further reductions or help the overall environment. Adapting to Climate Change -This category could see some of the carbon revenue used to build green infrastructure such as agricultural drainage systems and water retention systems to better deal with extreme weather events. 3. Imagine you have $100 from the carbon levy and you could spend it on the categories listed below. Please review these categories and note in the space provided how much of the $100 you would spend in each of them. You can spend it all in one category or you can divide the money among the three categories. 4. Here are some specific ideas for helping families and households adjust to a new carbon levy. Please choose the one you think are most important by ranking them from 1 to 3, where 1 is your first priority, 2 is your second priority, and so on until you have selected as many as you like. 5. Here are some specific ideas for investing in green projects that help the environment and clean growth that helps the economy. Please choose the ones you think are most important by ranking them 1 to 5, where 1 is your first priority, 2 is your second priority, and so on until you have selected as many as you like. 6. Here are some specific ideas for helping Manitoba adapt to climate change. 7. Please consult our Made-in-Manitoba Climate and Green Plan for the full list of priorities for protecting our environment and growing our economy. Tell us what ideas you like. Use this section below to give us any other suggestions you might have for actions on climate change and sustainable development. This completes the consultation questionnaire. Thank you for taking the time to provide your feedback. Your comments are very helpful as we move forward with our Made-in-Manitoba Climate and Green plan.